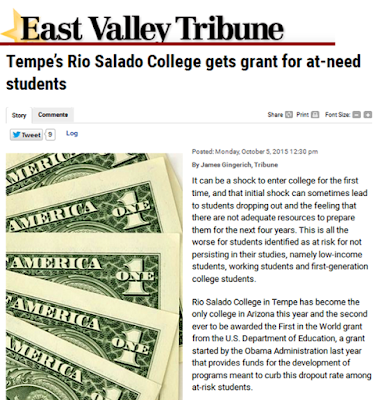 Rio Salado College | RioNews: Rio Salado in the News! Rio Salado in the News! The word is getting out about a $2.6 million grant Rio Salado will receive from the U.S. Department of Education to support innovation and improve student outcomes. This online story by East Valley Tribune reporter James Gingerich provides insights into how Rio Salado will use the funding to help new students succeed. It includes comments from Rio Salado Dean of Instruction Shannon McCarty and Interim Dean of Instructional Technology Michael Medlock, who are leading this new grant initiative. Learn more by watching the Oct. 5 edition of Cronkite News at ow.ly/T3tp0 for a report by Kendall Bartley and visit ow.ly/T5hME for additional coverage by 3TV Phoenix reporter Erika Flores.